In this article we will take a look on a new effective approach to customers feedback management during your software development. Software product development is not an easy game as it is no one-time effort. For your software application (or web application or website) to excel in its relevant domain and let all the competitors stand behind, it is indispensable that your software development becomes an ever-going process. However, what is the key ingredient for this ever-growing process? Well, that is the customer feedback. Receiving constant feedback from the customers or the end users of your web application or desktop application plays a vital role in penning down the strategies that you must follow in order to bring your product to the top. The World Wide Web today brings to you a very easy-to-use platform to get access to customer feedback in a very easy manner. This service is called BetaEasy. 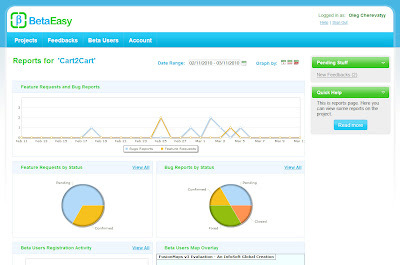 BetaEasy is an extremely popular online service that has been developed as customer feedback and beta management service. This customer feedback service collects the feedback from the end users of your application in one place, enables the owner of the website, web application or desktop application to form a community of users, and allows users to vote on features and bugs, among performing many other user-specific tasks. And what is even more important you can view feedback statistics anytime you want, that is displayed in a form of graphs and diagrams. The BetaEasy service can be integrated easily with any web application, website or desktop application regardless of what programming language and what shopping cart type has been used while designing the application or website. This feedback management service is offered as a “software as a service (SaaS)”. This means that you will not have to install or download anything in order to make use of this online link. Starting using this web link is also very easy. All you need to do is create your user profile and integrate your website, web application or desktop application with BetaEasy. Once this is done, you are all set to form community of your users for them to share thoughts, suggestions, and feedback with each other and also try solving any bugs, issues among themselves. Using this productive platform, the end users of your application can also submit their feedback, suggestions, and improvement areas for your product. What you get through BetaEasy is a constant customer feedback mechanism, which helps you to set strategies in order to make your product. Using this feedback management system, you get to know where your product lacks in terms of meeting all the requirements of the end users and you can improvise your product so that it meets all the needs and requirements that the end users want. Using this platform you can also respond to your users’ feedback and give them assurance that it does not go unheard. This online link is a great platform to let your users know that their feedback is much respected and that it is of utmost importance in making the website or software application serves all the needs of the end users. If this is what you always wanted, this customer feedback service is just the right platform for you.